Next Week is Spring Break! Thank you to all of you who attended Exhibition Night last night! It was a terrific evening and we are incredibly proud of our students for the excellent job they did presenting work they do here at DVS. Those of you who attended can register your attendance at tinyurl.com/DVSParentParticipation. Next week is Spring Break, and classes will reconvene for DV Science on Monday 4/9. Summer internship applications are now open! Applications are now open! Go to www.dvrealworldlearning.com/internship-opportunities.html to see the available opportunities and descriptions. Students can also go to the Resources tab to get help with their Resumes and Cover Letters. All applications are due on Friday, April 13. Internships last for 6 weeks in the summer and students will receive course credit for the internship. Annual Giving Campaign – Matching Challenge – Donate Today! There has never been a better time to support Da Vinci Schools!Donate or pledge by April 30, 2018 and your contribution will be doubled by our generous industry partners, up to $75,000. All pledge payments must be received by June 30, 2018 to be eligible for the match. Annual Giving dollars provide unrestricted funds and flexibility that allow us to address urgent needs and take advantage of special opportunities as they arise. They also provide funding for hands-on curriculum, a materials budget for every teacher, and much more. Donate today and DOUBLE your impact. Every gift makes a difference! Give online at: https://davincischools.networkforgood.com or download a pledge card today! Thank you! DVS students and parents, this is a reminder that the large gray building next to ours and its parking lot are private property, and our students should not be walking/riding/skating through it on their way to or from school. Also, students should not be dropped off or picked up by parents or Uber drivers in their parking lot or in front of their building. Please be respectful of their private property so that we can maintain the good reputation and relationship that we have with them! Thank you! Week 28: Exhibition on Thursday evening! Here is the schedule for this week, which is our spring spirit week (see dress-up themes below!) and includes our spring Exhibition Night on Thursday from 6-8pm. We hope to see you all there on Thursday evening! On Tuesday, April 24th, DVS will be administering the PSAT 9 to all 9th graders and the PSAT 10 to all 10th graders. These tests are age-appropriate and shorter versions of the SAT. The SAT is a college entrance exam that students will be expected to take if they plan to enroll in a 4-year college after graduation. Results from the PSAT 9 and PSAT 10 can help families prepare for the SAT exam in the 11th grade. All 9th and 10th grade students are expected to take the exams, and the cost of these exams is covered by DVS. For the first time ever, DVS is offering 11th graders the chance to take the SAT here at school. The benefit to this is that students get to take the exam in their own classrooms with their own teachers as a part of the regular school day. The cost for this exam is $60 per student, and the only thing students need to do to register to take the test is pay the $60 to the front office between now and testing day. If a student is eligible for free or reduced lunch, the school will use a fee waiver to cover the cost of the testing. While the 9th, 10th, and 11th graders are testing, the 12th graders will be enjoying the annual DVS tradition of Senior Beach Day. The buses for this event will leave the school at 9am, and DVS pays for the transportation cost of this special celebratory field trip. If you have questions about any of these events, please email Erin D’Souza at edsouza@davincischools.org. Wiseburn’s “Rock Around the Block” is this Saturday! WEF is holding an online auction prior to Rock Around the Block. The online auction is now open and closes this Sunday, March 11th at 9pm. Click on the link here to view the extensive selections of goods and services from local merchants and create an account to register to bid. Proceeds from the auction benefit visual and performing arts education, healthy lifestyle programs, teacher grants, STEM activities and DaVinci High school program grants. Shop and bid to help support our Wiseburn/DaVinci schools! You and your high school kids can volunteer to help by signing up here. Thank you! 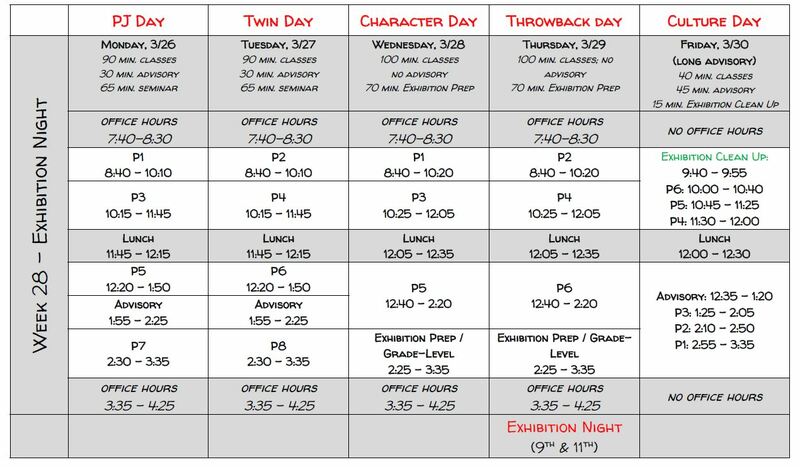 Here is the schedule for this week – Friday is a Professional Development Day, so students will not have any classes that day. The Spring Semi-Formal Dance will be this Thursday 3/15 from 6:30-9:00 pm in our Theater. Tickets are $10 and can be purchased on campus this week. Hi families of 9th graders! We are looking forward to seeing you this week for student-led conferences. We’d also like you to visit us again at the end of March to talk about high school transcripts, the next three years, and what you can be doing to prepare for college. Please sign up for one of the following small group college planning meetings. Next week is Student-Led Conference week – we hope to see all parents here at SLCs! 9th grade students will be taking the physical fitness test on Tuesday or Wednesday. We have completed our emergency lockdown drill and the students did a fantastic job – the entire floor was locked down in less than 30 seconds. I encourage you to talk to your kids about this experience when you see them this evening!